When a diagnosis of multiple myeloma appears likely, a medical history and a complete physical exam by a physician are necessary. After that, it is essential to complete the investigation with blood, urine and bone marrow sampling, in addition to radiological tests or nuclear medicine (if applicable), in order to establish the diagnosis. Blood and urine tests are essential to characterize the disease and the health condition of the patient with a suspected diagnosis of multiple myeloma. To do this, blood samples are drawn to evaluate the blood cell counts, as well as kidney and liver function. In addition, analyses are conducted to clarify the diagnosis and quantify the disease. Certain prognostic factors are also measured. For women of childbearing age children, a pregnancy test is recommended. A 24-hour urinary collection is useful for quantifying the presence of the disease and to evaluate kidney function. 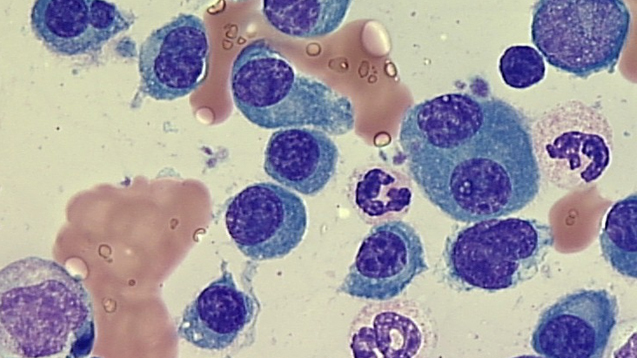 Patients with a suspected diagnosis of multiple myeloma must undergo a bone marrow exam. This bone marrow exam is one of the most important exams, because the bone marrow is the preferred site for the disease. The only reason to abstain from a bone marrow exam is when a biopsy of a multiple myeloma tumor mass (plasmacytoma) can be performed at another site. In this situation, bone marrow sampling can be avoided when the information concerning genetic abnormalities is not necessary for the patient’s monitoring and therapeutic approach. This exam has no absolute contraindication. However, precautions are necessary. The exam should not be performed at a site where there is an active infection. Clotting disorders, including thrombocytopenia (reduced platelet count) are not contraindications for the exam, insofar as the exam is performed by a qualified person. The bone marrow exam can be performed in various bones containing bone marrow. Traditionally, it is done in the pelvis, but it can also be done at the sternum. It is important to know that although a bone marrow aspiration is possible at the sternum, no biopsy attempts are recommended at this site. This is well known by physicians who perform this exam. At the start of the procedure, the physician locates the place where the exam will be performed. The physician then disinfects the area and installs a sterile drape to keep the site clean and reduce the risk of infection. The area from which the samples will be taken (skin, subcutaneous tissue and bone surface) is anesthetized with lidocaine. The various required samples are then taken using needle aspiration and biopsy trocar. For health professionals with access to the New England Journal of Medicine, a demonstration/instructional video of the exam is available (video from the N Engl J Med 2009 on the bone marrow exam). Other analyses: in some clinical situations, an additional quantity of bone marrow may be taken to evaluate minimal residual disease by flow cytometry. The bone marrow puncture-biopsy is a safe exam. Like any exam, however, it is associated with a reported risk of complications of less than 0.3%. The two most common complications are bleeding and infection. When they occur, they rarely require interventions such as transfusions, surgery or antibiotics. Medical imaging exams in radiology or nuclear medicine are required in order to document whether the multiple myeloma involves the bone or not. These exams are important because the treatment can be adapted accordingly. In general, simple x-rays of the skull, spine, ribs, pelvis and long bones of the arms and legs are taken. In some circumstances, a CT scan, an MRI or even a PET scan may be indicated. Once the diagnosis has been established, the stage of the disease has been documented, and the myeloma cells have been characterized, a treatment plan is discussed between patient and physician (hematologist or medical oncologist). It is important to point out that patients with a diagnosis of smoldering multiple myeloma do not require immediate treatment, and a more or less lengthy observation period is desirable for the majority of these patients.